Source: CICH graphic created using data adapted from: Lemmen, D.S., Warren, F.J., Lacroix, J., and Bush, E., editors (2008): From Impacts to Adaptation: Canada in a Changing Climate 2007: Government of Canada, Ottawa, ON, 448 p. https://www.nrcan.gc.ca/sites/www.nrcan.gc.ca/files/earthsciences/pdf/assess/2007/pdf/full-complet_e.pdf – accessed March 8h, 2017. 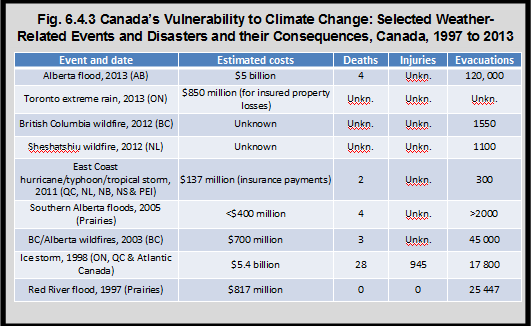 Recent wildfires, ice storms, floods, hurricanes, and other disasters have cost Canadians billions of dollars and too many lives.3 The table shows a portion of these extreme weather related events and disasters that happened between 1997 and 2013 in Canada and some of their consequences. 1Government of Canada. Canada’s Sixth National Report on Climate Change (2014). http://www.ec.gc.ca/cc/0BA54AAB-6E8E-4D48-B42C-DCBB09B27D10/6458_EC_ID1180-MainBook_high_min%20FINAL-s.pdf-accessed July 24, 2017. 2IPCC (2007). Climate Change 2007: Synthesis Report. Contribution of Working Groups I, II and III to the Fourth Assessment Report of the Intergovernmental Panel on Climate Change [Pachauri, R.K. and A. Reisinger (eds.)]. Geneva, Switzerland. https://www.ipcc.ch/pdf/assessment-report/ar4/syr/ar4_syr_full_report.pdf-accessed July 24, 2017. 3Lemmen, D.S., Warren, F.J., Lacroix, J., and Bush, E., editors (2008): From Impacts to Adaptation: Canada in a Changing Climate 2007: Government of Canada, Ottawa, ON, 448 p. https://www.nrcan.gc.ca/sites/www.nrcan.gc.ca/files/earthsciences/pdf/assess/2007/pdf/full-complet_e.pdf-accessed July 24, 2017. As children are more vulnerable to the effects of climate change than adults, they are likely to make up a large portion of those evacuated, injured, and deceased people as a result of climate change related events and disasters.